The New iPad boasts the best display around, a quad-core graphics processor, twice as much RAM and a highly improved five-megapixel snapper. The New iPad has a bigger battery than the iPad 2, so you don’t lose too much juice using that Retina display, however charging does take longer and if you’re using the device as it is plugged in, it won’t charge at all. Multimedia gets the real New iPad treatment thanks to the new Retina screen and that new graphics processor – so everything looks better, whether it’s games, films, ebooks or you’re just viewing and editing photos. iCloud makes it perfectly simple to synch all your apps, settings and media across your Apple devices, plus the iOS 5.1 is wonderfully easy to use. When Apple brings out new products, they often don’t seem that different from the last version – even though we have to wait ages between each release. The New iPad looks just like the iPad 2, but does sport an improved five-megapixel snapper, upgraded graphics processing and a new Retina screen – but is it enough to convince existing owners to upgrade? And does it stand up to some of the high-end tablets coming onto the market right now – the Asus Transformer Prime, for instance? The new iPad has a bigger chip and some alluringly good new display technology, but still manages to keep a stylish, slim body. It is a tad heavier than the iPad 2 (by 51g) and a small bit (0.6mm) thicker, but you’d hardly notice it in use. The device looks just like the iPad 2 with its glass fronted screen and aluminium reverse side – the bezel is still an inch wide and comes in white or black. The 9.7in display has a 4:3 ratio, which makes it easier to hold with one hand than some of the longer tablets – the Asus Transformer Prime, for instance. That display is a real treat for the eyes. It has an amazing 2048x1536 resolution – which means there are 3.1 million pixels and a 254ppi density. This screen has the highest definition you’ll see in a tablet – or a computer screen, or even in most HDTVs. It definitely offers more clarity and sharpness than the screens of its predecessors – view some high-res images, watch a Bluray movie or play an HD game to appreciate the full effect. It’s an incredibly responsive touchscreen – you can use taps, quick swipes and multi-touch gestures and get quick results. Use the Smart Cover to stand up the device and you’ll discover the onscreen keyboard is almost as good as a real keyboard for typing in long missives. In direct sunlight, it helps that the display is sharp and clear but it still suffers from quite a bit of reflection. Under the hood there’s a quad-core graphics processor boosting the existing dual-core A5 chip from the iPad 2, plus there’s a much improved five-megapixel snapper (although the front-facing camera is of the inferior VGA type). Multitasking gets a boost as it has upgraded storage of 1GB (expanded from 512MB). The New iPad has a 4G receiver that offers the speediest internet access so far – if you’re in the US. Here in the UK we’re still waiting for a 4G upgrade – so don’t buy the New iPad for its fast internet. 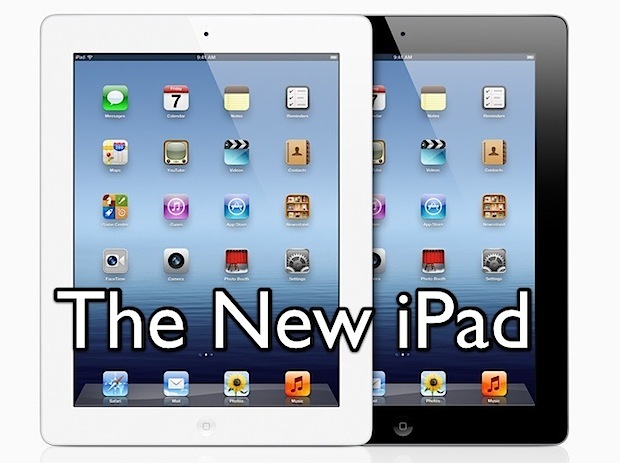 The New iPad runs on iOS 5.1 – an upgraded version of 5.0 that has the added benefit of multitasking gestures. Swipe down from the top of the display and a notifications menu pops up that offers alerts on games events, social posts and messages – as well as for any app that you've set up push notifications on. Push four fingers up from the bottom of the display and the multitasking bar will open – this is where you’ll see all your open programs. Rather than run them all concurrently, it actually keeps some open and shuts others down. When you’re using a program the same four-finger swipe will let you switch between open programs. Pinch your fingers together and you’ll be taken to the homescreen. It’s nifty and fun to experiment with. It is possible to upload any images from an iOS device to Photo Stream – and it is possible to then view them using another Apple device. You’ll need to connect to Wi-Fi to use Photo Stream – it syncs your last 1,000 snaps automatically. With iOS 5.1 it is also possible to delete images from Photo Stream manually. The interface uses a simple icon system, and there’s also a shortcut bar that can be customised to hold six apps and appear on your homescreen. You don’t get widgets a la Android, so you’ll have no live updates. But what this rather dull looking interface is is the front end of iCloud, which is a system that covers any other iOS devices or computers you own. iCloud ties together all your ‘i’ products – be it a computer, iPhone or iPad. All your apps, data and settings are stored online so you can easily access them from another device should you want to restore them from a backup – you can transfer all of your settings onto your new iPad for instance! If the worst happens and your lovely new iPad gets lost or stolen, iCloud lets you remote lock and wipe it, as well as track it. There is also some form of voice recognition – although don’t be expecting the digital personal assistant Siri, which appears on the latest iPhone. No. This is just a facility that lets you dictate a message or search term rather than typing it in. It’s not bad accuracy-wise – we tried it with a few different accents and found it was about 80% accurate. That fabulous retina screen comes into its own when you start looking at images. The pictures in the gallery are amazing – we tried out some snaps taken on a 14-megapixel camera and they were afforded true colours and absolute sharpness on the iPad’s display. We were able to zoom right in without seeing pixels – great for a design studio. Apple also launched an iPhoto app on the new iPad – this is a really useful tool – and for £2.99 you are able to add auto effects such as filters and frames, and edit photos improving sharpness, exposure and colour. One finger will let you desaturate or saturate certain areas, or you can run your finger over an area to soften it. It might not offer enough sophistication for a professional, but for anyone who wants to touch up their own images and have some fun with their photo editing it’s a great addition. You can also beam your images to other iOS devices using iPhoto. The email offering is comprehensive too. The view is two-column and it is possible to add a number of webmail accounts and synch the calendars as well. The Safari browser appeared on the other iPads and it still works well – offering tabbed browsing, pinch to zoom, bookmarking, the ability to save for later, email a link, print, tweet or add it to homescreen. We should mention at this stage that Twitter is well integrated too, and you’ll find it ingrained in each app, should you wish to share links and images. And if you’re always bemoaning the lack of support for Flash video on Apple’s devices, fret no more. There is now a standard alternative entitled HTML5 – and Adobe has launched a platform that lets Flash developers convert their work into HTML5, so hopefully you should be able to view most online video on your new New iPad. The snapper on board the New iPad is now a five-megapixel job that include VD video capabilities. It takes far better images than that on the iPad 2 and the HD video it produces offers decent colour and clarity. But the front-facing snapper is still of the inferior VGA type, so if you’re making Skype or FaceTime video calls, make sure you’re sitting in a well-lit room. It seems Apple might have worked on the wrong camera here – surely you’re more likely to use your New iPad for video calls than taking snaps? Apple has included a couple of home-user production apps on the New iPad. Garage band and iMovie have also had some upgrades to make the most of the new screen technology – they’re just right for anyone making movies and music at home, who doesn't want to spend hours working out how to use a professional program. However, there are plenty of other ways to enjoy the gorgeousness of the new screen – just watch some HD films or enjoy a good read with the Kindle app. And if you’re not interested in those, take your pick from the 200,000 or so apps that have been optimised for the iPad – loads of them will be getting upgrades in the next few months and weeks to help them make the most of that new display. 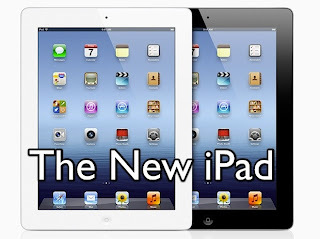 So far, so exciting, but did we find any issues with the new iPad? Well, on-board storage is rather measly and it really does cost if you want to bump it up. The Wi-Fi-only 16GB New iPad comes in at £399, but for anyone who wants to edit or watch HD content 16Gb is too miserly. The 32GB Wi-Fi Transformer Prime is £499 (with a keyboard included) and you can pay another 60 quid and bump up storage by 32GB using a microSD card. It would cost you another 100 quid on the iPad. Storing all your data and files on iCloud is also pricey compared with the likes of Dropbox. The battery also presents some issues – there have already been reports from users that it gets really hot when using a high-load program, and that delicious screen uses so much juice that you won’t be able to use and charge the device at the same time. However, we didn't experience any overheating – although the new, bigger charger did suffer from high temperatures. You’ll also see the battery running out of steam quicker than on the other iPads. There’s nothing particularly revolutionary about the new iPad, but it’s the third generation of a device that has undeniably made its mark and offers the most tactile experience of any tablet available at the moment. The screen is its big selling point – and if you’re into games, web, graphics or movies – this could well be the reason for buying or upgrading to the New iPad. When a screen is this good, offering a clear, colourful and intense experience, maybe there’s no need to do anything particularly special in terms of interface, processor or performance.